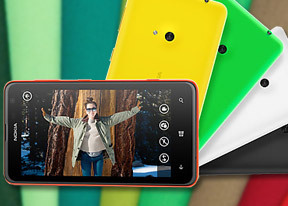 The Nokia Lumia 625 boasts a 5 MP camera which is capable of taking pictures of up to 2592x1936 pixel resolution. The camera UI is pretty simple - you have your viewfinder and a couple of controls on the right. Those are the still/video camera toggle and the Lens button. On the left you have an arrow that takes you to the images taken with the camera, alternatively you can do a swipe gesture too. The camera app on Windows Phone offers extensive settings, ranging from scenes and effects to white balance, contrast, saturation, sharpness and ISO among others. You have a dedicated Macro focus mode but no face detection. Holding the shutter key will wake the phone up with and launch the camera app. The Lumia 520 is not the fastest shooter around and it takes it a couple of seconds before a photo is taken. This is a longer delay than we're used to from smartphones of late. Nokia has preloaded the Smart Cam lens, which is by far the most powerful, plus the Panorama, Cinemagraph and Glam Me lenses. Nokia Smart Cam uses Scalado technology (Nokia owns the company) - it shoots multiple photos and lets you pick which one to save (a sort of burst mode). You can also pick the best face and cycle through each facial expression a person made while the camera was snapping photos. The third option is Erase, which will remove moving objects (e.g. someone walking in front of the landmark you're trying to shoot just as you press the shutter). The Nokia Lumia 625 fares surprisingly well as far as image quality is concerned. The level of detail is great for the 5 MP league, while contrast, colors and dynamic range are pretty good, too. Noise is kept to a minimum and the little visible noise is of the luminance type, which is more acceptable as opposed to the chroma one. The close up mode or otherwise macro is great. The Lumia 625 can focus from a really close distance. The Nokia Lumia 625 enters our photo quality comparison tool, where you are free to face it with any of the smartphones in our data base - the tool's page will give you information on what to watch out for. The camcorder interface is identical to the still camera's and has plenty of features too. You can change the white balance and turn the continuous auto-focus on or off. You can use the LED flash as video light. The Nokia Lumia 625 captures 1080p videos, which are pretty smooth, with lots of detail. Colors are accurate and contrast is good too. The continuous auto-focus sometimes is too sensitive though, but it's nice there is an option to turn it off. Unfortunately there is no touch focus option, you have to rely on the auto-focus for the video, and it sometimes fails when shooting close objects such as our Ferris Wheel for the video comparison tool. Bitrate is reasonable at 20 Mpbs and the framerate is firmly at 30 fps. The Lumia 625 captures only mono sound at 98 Kbps bitrate and 44 kHz sampling rate. Here's a 1080p video sample we've uploaded to YouTube. And here is one untouched 1080p video you can download. The Nokia Lumia 625 is ready to bump heads with the likes of the Lumia 920 and Lumia 925 in our video quality comparison tool. Once again you should consult the tool's page for information on how to operate it and what to look out for. The Nokia Lumia 625 has quad-band GSM/GPRS/EDGE support, tri-band 3G with HSPA and tri-band 4G LTE connectivity. If you're in range of an LTE network, the 625 will do up to 100Mbps downlink and 50Mbps uplink. If not, HSDPA still offers reasonably good speeds at 42Mbps downlink and 5.76Mbps uplink. The local connectivity is covered by (single-band) Wi-Fi b/g/n and hotspot, and stereo Bluetooth 4.0. Bluetooth is no longer limited as to what it can do - there's file transfer support now. Nokia Lumia 625 lacks NFC support and that's why the Tap+Send function is missing. The phone knows music and video, as well as pictures and documents. But if you have a ZIP or a RAR file, you won't be able to attach it to emails, because there is no file manager (although a third party app is now in its beta testing stages) and there is no app to recognize this file and list it in the phone. The Internet Explorer on the Lumia is the classic Windows Phone 8 deal, which has hardly changed with the minor update of the OS. The Lumia 625 has a big enough screen for comfortable browsing and the ~200ppi pixel density is enough though you'll have to zoom in on some tiny fonts. The Internet Explorer browser is great, though it's definitely not the fastest on the market. The looking glass button on the Lumia 625 brings you to the Bing search app. It's the same app we used to see - you type in a query and you get search results from the web and there's a pretty background photo with several translucent squares you can tap to learn interesting facts about the subject. With Local Scout now integrated into the places section of Nokia Maps, there are now two search features you can quickly reach from the default Bing screen. The first one is the camera scanner, which can snap a photo of text, run OCR and translate it into another language - this is the so-called Bing Vision camera lens. The second is the song recognition feature that gives you track and artist name and takes you to the music store so you can buy the track. What's missing is the homepage-like additional Bing Search screen. It seems the Amber update removes this functionality.